"The Belgrade is the only professional theatre in Coventry and so we act as both the city and region’s commercial and producing theatre. We are also highly respected for our groundbreaking community and education initiatives. Hamish Glen is the current Artistic Director and Chief Executive. We present a vibrant programme of produced, visiting and community work in our two auditoria and other spaces, which is informed by a distinctive and brave artistic policy. This policy is designed to cater to and develop the different audiences in and around Coventry, and to raise our profile as a producing theatre. We endeavour to bear witness to our community’s experiences, find a unique voice for the Belgrade in the context of the region and attract leading theatre artists – in short, re-establish the vision, radicalism and internationalism that marked the opening of the theatre in 1958." 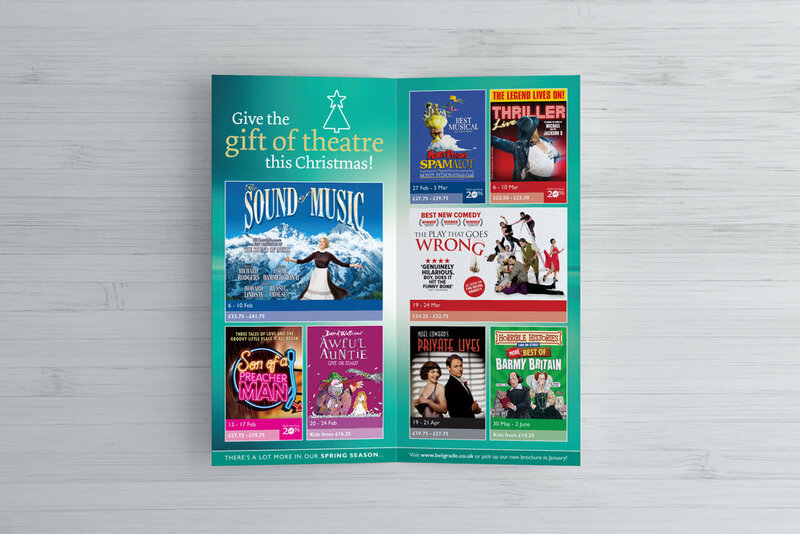 Create Onsight designed and produced a 'Christmas Gift Ideas' brand that was used across marketing materials ranging from a dedicated flyer to banner stands and for use online.